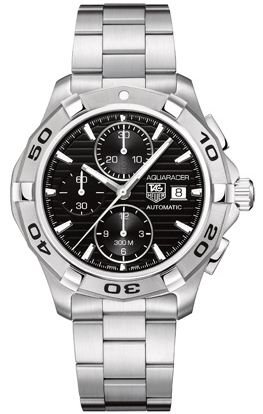 The Tag Heuer Aquaracer CAP2110.BA0833 does little to distinguish itself from the vast stable of the Aquaracer line. First, let us consider what the watch is and has in common with all of its brethren. It features scratch resistant sapphire crystal protecting the analog dial. It has a rotating bezel marked out in minutes. The housing is stainless steel. Likewise the bracelet is stainless steel. The timepiece also features a chronograph feature and a date counter at the three o’ clock position. The hands and markers are readily visible white against the black face of the dial. The watch hands are a bit broad and blunt at the tip for a precision timepiece. The most important element of any wristwatch is of course, the movement. Here there is an appeal to an appreciation of proper clockwork as the watch features an automatic movement, meaning that for the most part, it is self winding from the energy it collects from being worn. However, it may need winding from time to time, especially if set aside for a week long sabbatical from time awareness. The watch features water resistance to 300m. Consequently, in spite of the rotating bezel, this watch shouldn’t receive more water use than simple snorkeling or boating would provide. Of course, if you were looking for a watch for diving, you would probably be looking for a different material for the band. There are other models in this line that offer more features, like a day and date calender, or a magnifying lens over the date, as well as a variety of sub-dials, all within the same general housing and band package. This particular model is among the plainest of the lot. This can be an advantage or a disadvantage depending on your preferences. I have had this watch for 4 years and only started wearing it recently. It worked fine but after only 4 months it broke. It was never dropped or abused in any way. The service regarding the repair of the watch was terrible and they would not cover it under warranty even though it had only been worn for 4 months. They would not tell me what was wrong with the watch and would only say that they were completing a regular maintenance. I believe the self winding mechanism was broken since I could hear a clunking noise when shaking the watch. As far as I am concerned this watch is a piece of junk. Is this Calibre 16 ?